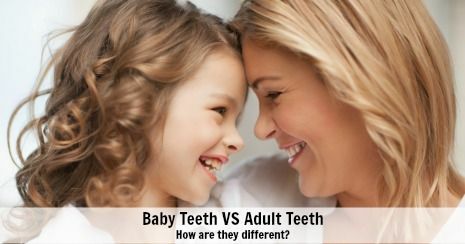 What are 5 differences between adult and baby teeth? 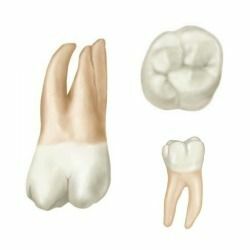 As humans, we grow two sets of teeth: primary and permanent. There are five primary differences between adult and baby teeth. The first set of teeth are called baby or primary teeth. The average first baby tooth will be visible around six months of age. A total of twenty primary teeth will grow in by the time your child is two to three years old. The second set of teeth are called permanent or adult teeth. 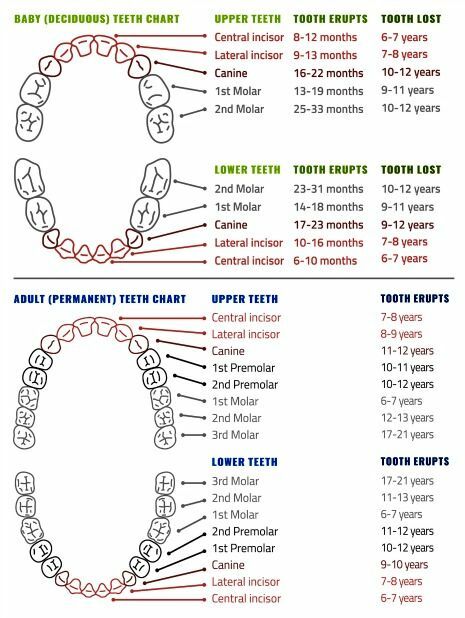 Typically, permanent teeth begin to grow in between age five and seven. An adult who has all their permanent teeth will have a total of thirty-two teeth. Application of dental sealants is a highly recommended preventive measure to help prevent permanent molars from developing tooth decay. 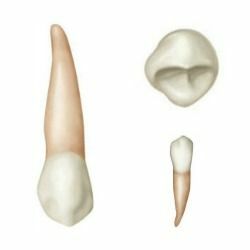 There are four different types of teeth: incisors, canines, premolars, and molars. Each tooth has a primary function. The number of each type of tooth varies between primary and permanent teeth. Shaped like a flat chisel, incisors are used to cut and chop food into bite-sized pieces. Sharp and pointed, canines help grip and tear food. 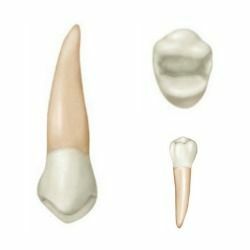 Premolars are a miniature sized molar and help to tear and crush food. Molars, the largest tooth work alongside the tongue to chew, crush, and grind up food until it can be swallowed. Each tooth has a crown and a root covered by gum tissue and each tooth has three primary layers: enamel, dentin, and the pulp. 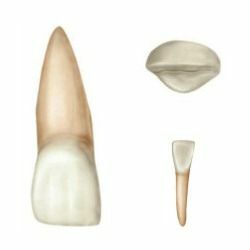 The crown is the visible portion of a tooth made of hard enamel. 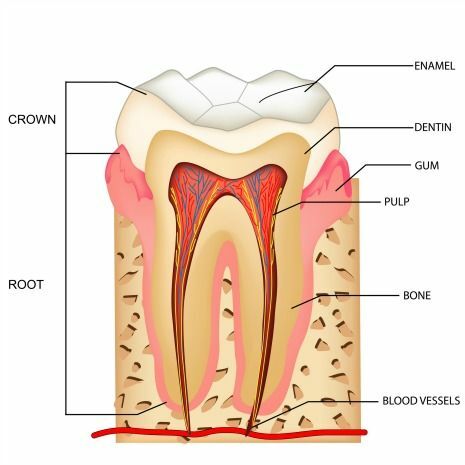 The root is the part of tooth that is embedded in the jawbone. The root makes up about two-thirds of the tooth and is covered with gum tissue. The roots of primary teeth are often more slender and shorter than permanent teeth. The visible line where the tooth and gums meet. The gum line is susceptible to inflammation if not properly cared for. Enamel is a hard mineralized layer of tooth that is susceptible to tooth decay if not properly cared for. The thickness of enamel determines the outward color of a tooth. Primary teeth have a thicker layer of enamel, hence appear brighter than permanent teeth. Dentin makes up the bulk of the tooth and contains nerve endings from the pulp. If your dentist tells you that you have a dental cavity that requires a dental filling, it means that the decay has tunneled through the enamel layer and into the dentin layer. Left untreated, the decay will progress into the nerve of the tooth causing a painful toothache. The pulp is the innermost part of a tooth. The pulp contains nerve tissue and blood vessels. Tooth decay reaches the pulp, the tooth will become infected and painful. Primary teeth have a smaller nerve chamber than permanent teeth. If you have a question, don’t hesitate to contact us. Call (763) 586-9988 or ask us at your next appointment.